The "Original," with a "mirror finish" 304 stainless steel body, double-rolled end caps, sintered bronze rod bushing, Buna N "U" cup seals and our specially formulated HT-99 lubricant. Bore sizes: 5/16", 7/16", 9/16", 3/4", 7/8", 1-1/16", 1-1/4", 1-1/2", 1-3/4", 2", 2-1/2", 3". Wide variety of mounting styles. Many standard catalog options: bumpers, extra rod extension, Magnalubeｮ G lubrication, heavy spring, rotated ports, low and high temperature options, magnetic piston, rod wipers, no-thread rod and more! Quick delivery of catalog models -- we stock more than 150,000 and can make any catalog model in 5 days or less. If you need something a bit different than what's in the catalog, call us! More than half of our business is "special" cylinders that we designed for specific applications. 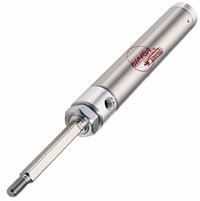 These magnetic position sensing cylinders are available in 5/16" and 7/16" bore sizes. Can be used with Bimba's sinking and sourcing switches and miniature reed switch. Feature a low profile track on the cylinder body, a 40% profile height reduction compared to traditional track styles. Our Original Line corrosion-resistant cylinder for applications and environments that require exposure to moisture, lubricants and certain solvents. 304 stainless steel body, 303 stainless steel rod, acetal resin end caps and stainless steel accessories. 3 mounting styles and a wide variety of catalog options. Bore sizes: 9/16", 3/4", 1-1/16", 1-1/2", 2". 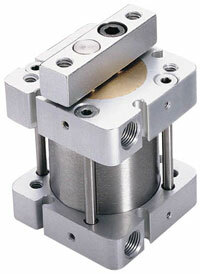 Our Original Line non-rotating cylinder for applications requiring precise guided movement. We use a unique square piston rod with rounded corners that prevents rotation better than other rod configurations, offering a rotation tolerance of 2-1/2ｰ or less. 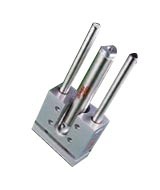 Special high-strength aluminum alloy rod guide offers high load carrying capability and abrasion resistance. A urethane-based rod seal provides excellent seal life and leak-free service. 2 model types, 4 mounting styles and a wide variety of catalog options. Convenient for horizontal or side mounting, with provisions for both bottom flush or face mounting. 304 stainless steel body, oil-impregnated bronze rod bushings and 303 stainless steel piston rods. 4 model types, a choice of stroke lengths and a wide variety of catalog options. Bore sizes: 3/4", 1-1/16", 1-1/2", 2", 2-1/2", 3", 4"; 19mm, 27mm, 38mm, 50mm, 63mm, 76mm, 101mm. Quick delivery of catalog models -- we stock a wide variety and can make any catalog model in 3 days. Need something special. Call us! Our dual piston rod, square non-rotating cylinder for extremely compact applications where rotation can't be tolerated. 304 stainless steel body, oil-impregnated bronze rod bushings, and 303 stainless steel piston rods. A choice of stroke lengths and mounting styles, and a wide variety of catalog options. Bore sizes: 3/4", 1-1/16", 1-1/2", 2"; 19mm, 27mm, 38mm, 50mm. A choice of stroke lengths and a wide variety of catalog options. Immediate delivery of catalog models -- we'll ship in 1 day. Need something special, call us! 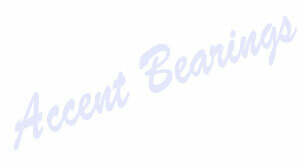 Ball Bearing T Series: Case hardened steel shafts and ball bearings offer less friction, higher precision. Composite Bearing TE Series: Offers high load capabilities. Composite bearing/303 stainless steel shaft combination makes it ideal for corrosive environments. Additional bore sizes including 2-1/2" and 3". New! Additional bore sizes including 2-1/2" and 3"
2" bore adjustable air cushion option slows cylinder speed at the end of the stroke, attenuates noise, and absorbs energy. Multiple position Linear Thruster provides three positions in a single unit. Shock absorber options in the 9/16" to 2" bore sizes are available in light, standard and heavy-duty models for energy absorption where high kinetic energies are produced. 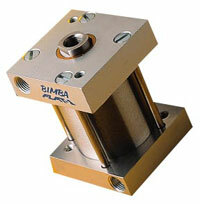 Lightweight, small-bore pneumatic actuator provides continuous position sensing. Rotary potentiometer assembly mounted inside the actuator provides position feedback information. Ideal for applications where the use of external magnetic position sensing switches is impractical; where variations in actuator rotation or speed are needed; where an operation requires constant monitoring of actuator position or where repeatability is required. Bore sizes: 1-1/2" and 2". Low profile track on the actuator body allows these switch-equipped rack and pinion rotary actuators to be used in tight spaces. Can be used with Bimba's patented Giant Magnetoresistive (GMR) switches and miniature reed switches. Features corrosion-resistant stainless steel and anodized aluminum construction with no external seals. 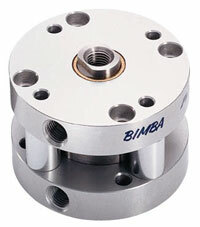 Available in five bore sizes -- 9/16" to 2"; single and double rack models; five standard angles of rotation. Standard options include ball bearings, angle adjustment for 45° of adjustability at each end, adjustable cushions, dual shaft, rear shaft, square key, hardened shaft, Viton® or oil service seals. Our original round cylinder for single, double and reverse acting applications. Bore sizes: 9/16", 3/4", 1-1/16", 1-1/2", 2", 2-1/2", 3", 4"; 14mm, 19mm, 27mm, 38mm, 50mm, 63mm, 76mm, 101mm.